Five years ago, the US led an effort to have the International Maritime Organization address the increasing problem of shipping noise as a contributor to the ocean’s rising background ambient noise levels, which reduces the effective communication area for many species of ocean life. The first couple of years were promising, beginning with the creation of a “high priority work programme” to be undertaken by a special Correspondence Group. The first report of the correspondence group, submitted in spring of 2009, along with a submission from IFAW and Friends of the Earth that identified the likelihood that the bulk of shipping noise comes from a small percentage of the noisiest ships of each size, laid the groundwork for rapid adoption of the proposed voluntary guidelines for ship quieting. This year’s IMO newsletter, though, tells the sad bureaucratic story of how these sorts of initiatives can wither on the vine. The Marine Environmental Protection Committee this year merely “reaffirmed the previous agreement that non-binding technical guidelines designed to reduce the incidental introduction of underwater noise from commercial shipping, be developed as a means to reduce the potential adverse impacts of this noise on marine life. The Committee agreed to keep this item on its agenda for MEPC 64.” It appears that the Ship Design and Equipment Subcommittee has been charged with the task of drafting the voluntary guidelines, but their report makes no mention of this work. During the 2000’s, NOAA made great strides in acknowledging the central role that shipping noise plays in any consideration of ocean noise management; it were these efforts that led to the initial impetus to get the IMO, which regulates global shipping, to begin to address it. It’s sad to see how easily such efforts can lose steam. Perhaps we can take heart from a statement made by IMO spokeswoman Natasha Brown after the release of a study this spring that linked stress levels in whales to ocean noise: “The Marine Environment Protection Committee (MEPC) of the IMO, when it meets for its 63rd session, will review a number of submissions relating to noise from commercial shipping and its adverse impact on marine life. The MEPC has previously agreed on a need to develop non-binding, technical guidelines and consider solutions to reduce the incidental introduction of underwater noise from commercial shipping, so the issue is very much on the IMO’s agenda and governments are welcome to submit relevant information and/or report to MEPC.” While it appears that the MEPC did not actively engage the issue this year, it is indeed still on their radar, though perhaps not as brightly as it was a few years back. For more on the glory days of efforts to address shipping noise, see the AEI’s Ocean Noise 2009 Special Report, pages 18-23. Kern County, CA, surrounding Bakersfield and straddling the mountains and the Mojave desert, is home to one of the more iconic wind farms of the first round of the US wind industry. Just east of Tehachapi, over 5000 turbines were built during the 1980s and ’90s. Now, faced with a slew of new wind projects, the Kern County Planning Department is working double-time to find a way to manage the future build-out of wind (and solar) development in the region. This week, county planners began hosting meetings at which the latest planning maps are being presented for public comment. Fourteen new wind farms have already gained approval for construction within the proposed Wind Inclusion Areas, with three others awaiting permits. Looking at the big picture, the Wind Inclusion Zones (the lighter areas on the map to the right) represent a small portion of the sprawling county, though arguably a substantial portion of the transition zone between the mountains and desert. 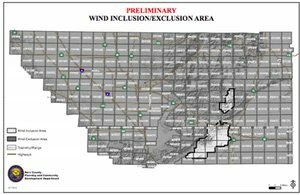 A much larger “Proposed Kern County Wind Resource Area” was released in draft form at similar meetings late last year; the new maps retain the southern portion of that Resource Area, but greatly reduce the northern extent of wind development. Kern County is in an especially intense version of the local decisions being faced by communities in many parts of the country. Local opposition to wind expansion is based on many factors, including dominating the landscape and concerns about wildlife, especially raptors. For those living in the Inclusion Area, noise is a significant concern; neighbors of current wind projects in the area say that turbines are commonly audible to a mile or more, and under the new proposals, many more people in what has been a quiet, remote landscape will be living within earshot. At the same time, military exclusion zones, fire hazard areas, existing parks and national monuments, and other factors combine to limit wind and solar development to a small portion of the area in which they might otherwise make economic or energy-production sense (ie areas of reliably high winds or bright sun). 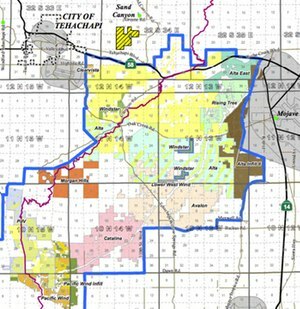 There are no easy answers to questions about how best to balance energy production against local impacts; Kern County offers an especially vivid sense of the tensions involved, with its creation of virtual sacrifice zones that, while not huge in the grand scheme, are large enough to impact many residents. “Quite a large proportion of our sea area will probably be used for offshore wind farms,” said Hans-Ulrich Rosner, head of the Wadden Sea Office for WWF in Germany. “This will have a serious impact on nature, which needs to be mitigated.” Harbor porpoises, common in the North and Baltic Seas, appear to be especially sensitive to noise, adding to the challenges. Construction of the 108 MW Riffgat offshore wind project is nearing completion; it’s been utilizing a double-walled, water-filled casing in which bubbles are produced to absorb some of the sound from pile-driving of the turbine foundations into the seabed. In addition, a less intense vibration method is being used for almost half the depth of the piles, with the louder hammering of classic pile driving being used for only the last 40 meters. These noise reduction techniques amount to half of one percent of the total cost of the wind farm. 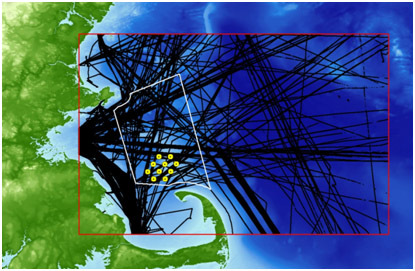 The latest paper to be published by the research team that’s been studying noise levels in and around the Stellwagen Bank National Marine Sanctuary concludes that in the waters off Boston, increasing shipping noise has reduced the area over which whales can hear each other to about one-third of what it used to be. Bonus: 2010 Science magazine audio interview with Leila Hatch, lead author of the new paper. A great post over on Artemia, a University of British Columbia blog, from Jessi Lehman, reflecting on listening to the LIDO online undersea sound streams. Go read the whole thing for sure! …These ocean observatory networks are about science and whale conservation but also about industry, development, and geopolitics. But I want to come back to the experience of listening. What is it, exactly, that we hear? Mostly just faint static, like the sound of rain falling. Mostly I find myself listening in apprehension, for what could be there. Some would call this kind of undersea listening remote sensing, but it feels more like interspecies or even otherworldly eavesdropping. To be honest, it feels a bit weird. And it’s not just that I’m so far from the ocean, in a place dry and hot and decidedly un-marine. I can’t say that I understand the undersea environment better by listening to these sounds (though I can’t preclude the possibility that on some level I do). Mostly I am made aware that this is a world I don’t know, can’t know, and can only access thanks to complex technological mediations – and even then only marginally. This makes the experience of listening even stranger. My project puts the concept to work at a whale research laboratory, Cetacea Lab, located on a remote island in Caamaano Sound, Northern, BC. Through a seven-week fieldwork residency (August- September 2012), I hope provoke thoughts on how broader knowledges relate to sustained acts of whale listening. In particular, I will pursue two questions 1. how work in acoustemology, hitherto focused on Indigenous encounters in the developing world, can be challenged and extended by an outdoor laboratory science setting, (Feld, 1996, 2003; Daniels, 2008; Maxwell, 2008; Ramnarine, 2009); 2. to understand how Cetacea Lab’s activities produce an acoustemology of Caamano Sound and its environs. Two small wind farm projects in southeastern Massachusetts that have stirred neighbor complaints about noise over the past several months will be tested for compliance with state noise limits. Massachusetts Department of Environmental Protection (DEP) rules require that noise sources increase existing noise levels by no more than 10dB. This summer, one of the turbines in nearby Falmouth was found to sometimes exceed that difference at night, and was temporarily shut down except for some daytime sound testing periods. Both Falmouth turbines remain off at night, and are now operating during the day. UPDATE, 8/10/12: Good piece in the Boston Globe today recapping the latest noise monitoring developments. When a University of Washington researcher listened to the audio picked up by a recording device that spent a year in the icy waters off the east coast of Greenland, she was stunned at what she heard: whales singing a remarkable variety of songs nearly constantly for five wintertime months. 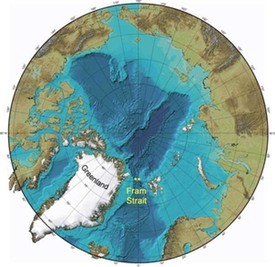 In a paper just published in the journal Endangered Species Research, and freely available online, Kate Stafford and her co-authors report on acoustic monitoring that took place in the winter of 2008-9 in the Fram Strait, between Greenland and Spitzbergen, a key channel for water circulation between the Arctic and Atlantic Oceans. The song diversity noted here is unprecedented for baleen whales. Whether individual singers display 1, multiple, or even all call types, the size of the song repertoire for Spitsbergen bowheads in 2008 to 2009 is remarkable and more closely approaches that of songbirds than other baleen whales.